We are celebrating Abraham Lincoln and George Washington this week. We began with Abraham Lincoln today. I had a picture of Abraham Lincoln up and I asked the children if anyone knew who he was. One little girl said, "He's money." I was a bit impressed. When I told them his name one little boy said, "Oh yeah, I knew that." We talked about who he was then I had a book about him we went through quickly. I didn't actually read everything, mostly we discussed the pictures on the pages. We don't have many books about the presidents. 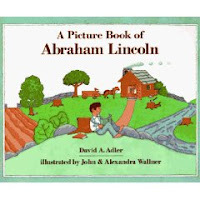 Our book was," A Picture Book of Abraham Lincoln," by David A. Adler, illustrated by John & Alexandra Wallner. I will have to keep an eye out for some. The next part was the best for them, I brought out some money. First the $5.00 bill. I didn't have one for everyone individually, but they all got to take a gander. Next, I gave them all a penny to look at, hold, and feel. Way back when I was in college we learned that if you look at the Lincoln Memorial on the back of a penny, you can see Abraham Lincoln sitting inside. We actually did this project and he was there. Today I had shiny new pennies for the children, we had our magnifying glasses, but I couldn't find Lincoln in the memorial. Maybe they don't put him in anymore? We did get to see him in the memorial on the $5.00 bill. First put the glue on the paper in a "squarish" shape. 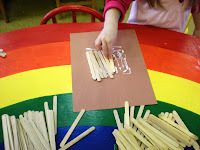 If you don't mind too much glue you can let the children put the glue down. 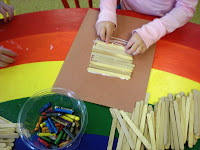 Allow the children to cover all the glue with popsicle sticks to make the shape of a house. 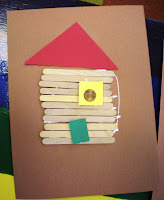 After the house is made let the children add the roof, door, and window. Finally, give them a penny and let them glue Mr. Lincoln in the window. (They love that they get to take a penny home. 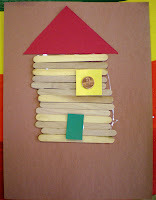 Over at Creative and Curious Kids they have some pretty great log cabins too. Happy building! Your cabins turned out great! Oh my goodness. 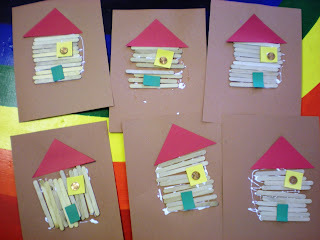 I made these a few years ago with my preschoolers. Cute! I am planning on making these with my class too! Love the idea! One thing I am adding before the art part of the project is a science experiment...We are going to clean old dirty pennies and make them brand new looking and shiny. All you need is 1/4 cup of white vinegar, 1 teaspoon of salt, a clear shallow bowl, and something to stir with. Drop the dirty pennies in the mixture and stir for a minute or two...and its like magic! The children are amazed!